This pattern has been sitting in my pattern stash for at least a year (probably longer). 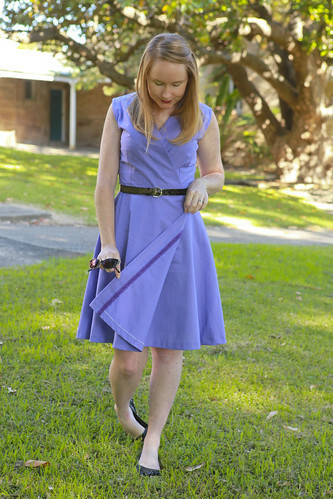 I fell in love with the violet dress on the front as soon as I saw it, but the only problem was that I just couldn’t seem to find the right coloured fabric! 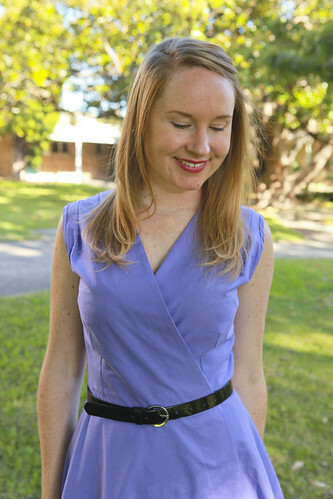 It needed to be a violet wrap dress. No other colour would do. Needless to say, I found the right fabric a few weeks ago, but guess what? It’s actually cotton quilt backing! I know, I’m such a rebel. The best thing about buying quilt backing for a project? You get twice the amount of fabric for the same price because it’s folded over double on the bolt. You really can’t lose folks. I also added some purple hem lace to the front line of the skirt. This was actually lace left over from our wedding and I still have a bunch of it in all sorts of happy colours. 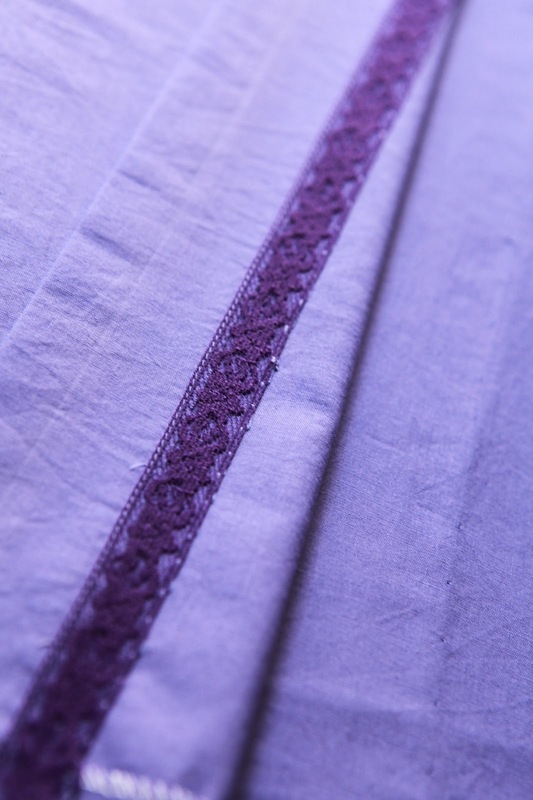 I really love the result and think my next few garments will probably all have lace detailing of some kind on them. Last but not least, I swapped out the arm facings for bias binding. I have a tutorial on how to make your own bias binding here and will have a tutorial on replacing arm facings with bias binding on my blog on Friday! Vintage Fridor Stitchmaster “Merino” Sewing Machine. I’m a pear shape and my heart jumps for joy when I see a pretty project with an a-line. This is so flatteou ring and the colour compliments your skin/hair wonderfully! That is a really good color on you. Agree! The color is gorgeous on you! Yay for waiting for the right color. It’s perfect. Love all the hand sewing. This is so lovely! I love the addition of the lace. It’s the small, clever little touches on the inside that make sewing your own clothes such a joy. Keep up the great work! This dress is very nice. I love wrap dresses, but the lace on the inside of the “wrap” makes it extra special. Hand stitching can be a lot of work but so worth it.